Cirque du Soleil is thrilled to return to Philadelphia, PA with its coolest arena show yet—CRYSTAL. This one of a kind arena production blends circus arts and the world of ice skating in a stunning new production that will take the audience on a journey into a whimsical frozen playground where figure skating mingles with acrobatics and aerial feats. 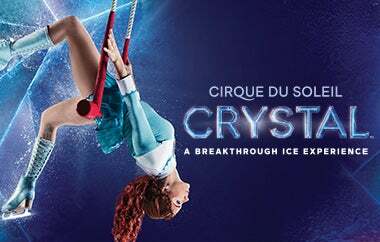 CRYSTAL will perform at the Wells Fargo Center from Thursday, June 20 through Sunday, June 23, 2019 for six performances. Tickets will go on sale on Friday, November 16 at 10 a.m. exclusively through WellsFargoCenterPhilly.com by phone at 1-800-298-4200 or in person at the Wells Fargo Center box office. Saturday, June 22 at 4 p.m. and 7:30 p.m.
Sunday, June 23 at 1:30 p.m. and 5 p.m.